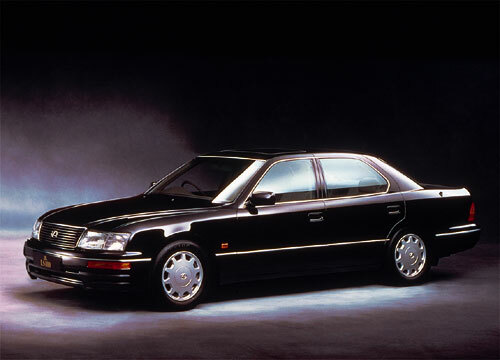 After the Scorpio - the Lexus LS400? In two years time I shall be retired, with a considerable lump sum in the bank, a regular pension coming in and the mortgage paid off. I will have no need to work, but I'll probably do something a couple of days a week. In fact the car was so good that Toyota emphasised its pedigree by badging it separately, and the Lexus became the new badge of luxury. It is seriously compared favourably with the Mercedes S-class, the Jaguar XJ8 and the BMW 7-series - except for the price. Well, there is no chance of me buying it new - but a used LS 400 makes a very good buy. The usual advice is to buy the newer car with high miles, rather than older with low miles. There is absolutely no reason to fear a Lexus with 100,000 miles on the odometer - it is just run in. Providing that it has been serviced yearly with the engine oil and trans fluid and filter changed and the cam belt changed at 60,000 intervals the engine and transmission is bombproof. 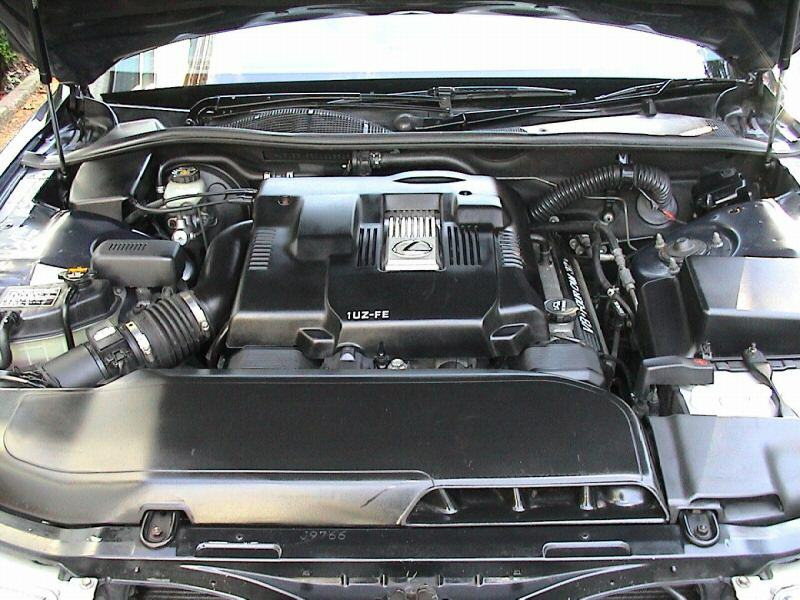 The Lexus V8 4.0L engine is legendary. It uses 32 valves and commenced with 241bhp on the Series I. It is uncannily smooth and quiet and linked to the electronic automatic gearbox provides a silent, magic carpet ride that has to be experienced to be believed. It is so quiet that you may have to restrain passengers from opening the door at 30 mph - they think you are coasting to a stop. Quiet? It's so quiet that you can chat to your passengers as they're getting in and start it without them noticing. Then you can suddenly put it in D and move off - this never fails to impress! The interior has a hardwearing leather interior of unbelievable quality. If you have seen the latest Volvo leather seats forget that pimply rubbish - the Lexus hand-stitched leather is as smooth and soft as a baby's bum, and the walnut is real, too. Even on the very first Lexus in June 1990 everything was electric - both seats, memory for driver, steering wheel rake and reach, mirrors, windows - all powered as standard. The stereo has to be the best I have ever heard. It is a surround-sound 7 speaker HIFI with all the gizmos, including a subwoofer built-in to the bodywork, and the car is so quiet even at 50mph that you can hear the last bars of the Largo from Dvorak's 5th - you know where the basses play those low chords on the wood of their bows. This is a seriously cool setup - owners have been known just to sit in their car in the garage and listen to their favourite CD in the multichanger. It sounds sad until you have heard it for yourself, and then you understand. 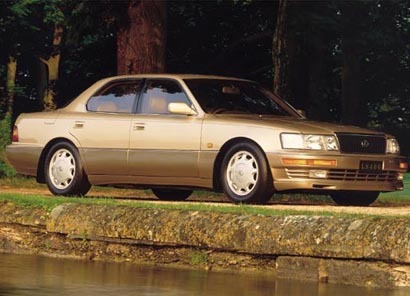 The LS400 was introduced in the UK in June 1990 when it caused a sensation. It's silky-smooth 4.0L 32-valved was rated the finest V8 engine in the world, and produced 241bhp at 5,400rpm from its 3969 cc. Torque was 350 Nm at 4,400 rpm. Together with the 4-speed (often wrongly reported as 3-speed) electronic automatic transmission the car reached 60 mph in 8.3 seconds with a kerb weight of 1815 Kg. Owners report that even if you stand on the accelerator and use maximum power right up to the limit you can just about hear a growl from the superb quad-cam engine. Standard specification was very high, with full leather interior, real walnut, computer-controlled air conditioning and electric windows, seats (with 2 memories) steering column, mirrors, sunroof, fuel flap and boot release and cruise control. The car used fully independant suspension, and ventilated brake disks with ABS and 15" alloy wheels with 205/65 ZR tyres. With a drag coefficient of 0.27 and a gentle right foot you should achieve fuel consumption in the high 20s. The Series II arrived in November 1992. The engine was unchanged, but the specification included 2 front airbags and seat-belt pretensioners and larger brake disks front and rear. The alloy wheels were now 16" diameter using 225/60 tyres. Performance was virtually identical but the SII was slightly heavier on petrol. I do feel that this wheel size better suits the car. And quiet? It endangers your driving licence because 80mph feels like 30 and it is easy for a minute's inattention to result in a big speeding fine. Perhaps it's as well that cruise control is standard, then: one just has to remember to engage it in areas where there might be speed cameras. 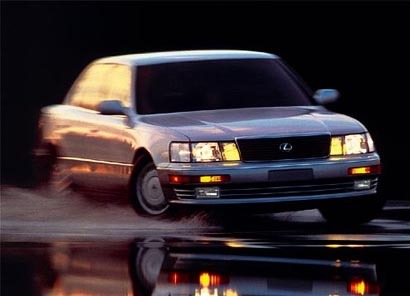 Lexus worked hard on the next update, and there were marked changes for the Series III, which arrived in January 1995. A raised compression (10,4 from 10.0) and other changes raised the power to 260 BHP at 5,400 rpm and torque to 269 Ib ft at 4,600 rpm - however, the kerb weight had gone up slightly to 1725 kg. Nevertheless, the new car reaches 60mph a second earlier at 7.4 seconds and the Cd is now at 0.27. Top speed remained limited to 155 mph. ABS is now computer-controlled, and the driving mirrors now automatically dip to prevent driver dazzle. Lexus engineers did not rest and in January 1998 the Series IV arrived. This was to be the last of the fabled LS 400, for subsequent models would be renumbered LS 430. 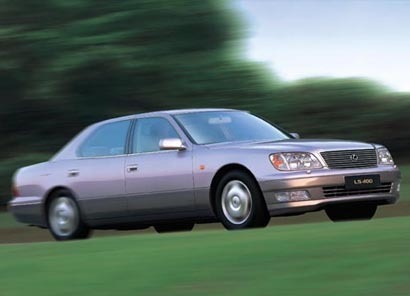 This means of course that they were automatically devaluing the last of the LS 400's - bless you Lexus for looking after us in the Used Car Market - and late LS 400s are now very good value indeed. From a List price of £50,000 new you can pick up a low mileage example now for perhaps £17,000, while hi-mileage cars are in the region of £8-11,000. What a lot of car for the money! The engineers also added Vehicle Stability Control, which can sense the vehicle becoming unstable and apply braking effort to correct it. A new 5-speed automatic box takes over and the headlights become HID with self levelling. Every interior is now equipped with Toyota's own Satellite Navigation system which is controlled by a touch screen mounted in the centre fascia. Graphics and a voice guides the driver to the destination. I bought my LS 400 with 100,000 on the clock four years ago, and I just changed a light bulb. I drove my LS 400 hard to 100,000 miles, and then sold it to my brother in law. He's put 75K on it with no probs. The LS 400 is the best car I ever had. Gas mileage is low but 120,000 miles with just one alternator repair. 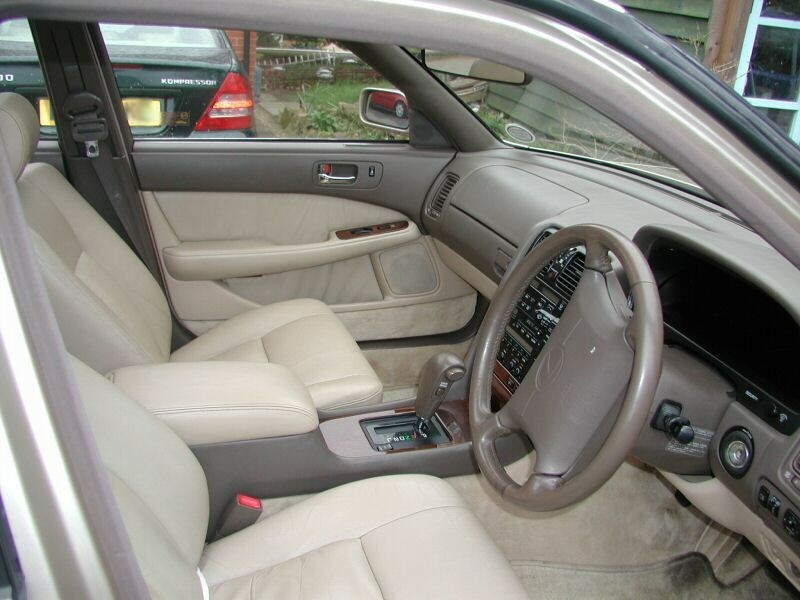 Highest quality leather in all LS 400s - this one is a Mk III. The later model adds a full satnav touchscreen in the centre of the fascia. Although this particular car has 130,000 miles on the odometer there is no sign of it here, except perhaps for the carpet near the foot-operated parking brake. Although it is carefully concealed beneath all that plastic panelling, there is a world class-leading V8 in there. A quadcam 32 valve (VVC on Series IV cars) is as quiet as a sparrow's fart. Even jamming the pedal to the floor and engaging the full torque of the motor the sound from this engine rises to a ... murmer. Did I mention how quiet the interior is? It's so quiet that the starter motor pinion and ring gear has to be strengthened and designed to fly off easily when engaged with the engine running - every new driver tries to start the engine when its already running. Because there is no noise at all after the starter disengages they assume the engine has failed to start. After a while the driver learns to check the tacho to confirm that the V8 is actually turning. Early cars may have had uninvolving steering - whatever that is - sometimes I think that the motoring hacks live in some imaginary world where everyone else is too poor to run a car and the roads are empty of traffic so one can thrash a 2-tonne car about on country roads and find the limit of adhesion in wet and dry and differing cambers, hang the tail out and try to find the under or oversteer. The rest of us drive on crowded roads where if we buy a £50,000 luxury car we want it to be comfortable and quiet and luxurious and not find that we have bought a sports car after all! But here is what I think of the motoring hacks. Some owners mention the seats on the Series 1. Too hard, some say. Others disagree. Now what can an owner get for his money? A Series 1 1990-91 LS 400 is easily purchased for £1-3000, but one wouldn't go for those. Neither is the Series II necessarily the one to look for unless the budget is really tight. The series III with the more powerful - and frugal - engine would be a better bet. These are around £5-6,000. A mid-mileage single-owner Series IV is the one to aim for, having the better VVC engine, five-speed auto, Sat-Nav, Vehicle Stability Control as well as Anti-dive and Anti-Squat geometry. These can be had for £12-18,000 depending on private or dealership purchase. It's strange how one just assumes we will be able to do things 'in the future' without pausing to reflect if we have one! Recently, an old friend of mine, a hard-working guy who had recently retired, to ok a cough and shortness of breath to his GP - and was sent straight to hospital with cancer. There you go, fit as a fiddle to a terminal ward in two weeks! So once I retire I'm not going to do the 'sensible' thing and buy a Ford Fiesta or a Nissan Micra because I'm retired and on a fixed income. This life is the only one I'm going to have so I'm going to make sure I do the things I have always promised myself I'm going to do. Yes, I will own one of the best cars in the world, the Lexus LS 400. I don't care that the mpg is no better than my Scorpio, or that the insurance costs are higher - I want to experience that luxury and silence before senility gets me and I sit hunched in a high chair dribbling into my soup. 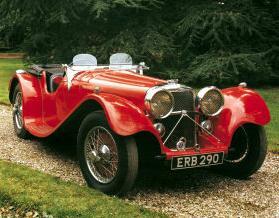 Yes I will build my Jaguar SS100 replica and drive it to Le Mans for the race weekend. If I can, time and money permitting, I may even build that ultimate sports car: the Ultima GTR. On a track day I will seriously hack off the guys in their Nissan Skylines and Ferrari F50s as I pass them like they're standing still.